Bizagi BPM Suite is composed of three products: Bizagi Modeler, Bizagi Studio and Automation Server. Bizagi Modeler and Bizagi Studio can be used free of charge and need no licensing. Bizagi Studio supports a maximum of twenty (20) Users in development and testing environments. Automation Server is the only product that requires the User licensing described above, to enable end users to participate in the automated business process. For more information please read our End User License Agreement (EULA). If you need more information about our licenses, buying or you have further questions, contact us. After purchasing a license for the first time you will receive an email with a License Key. 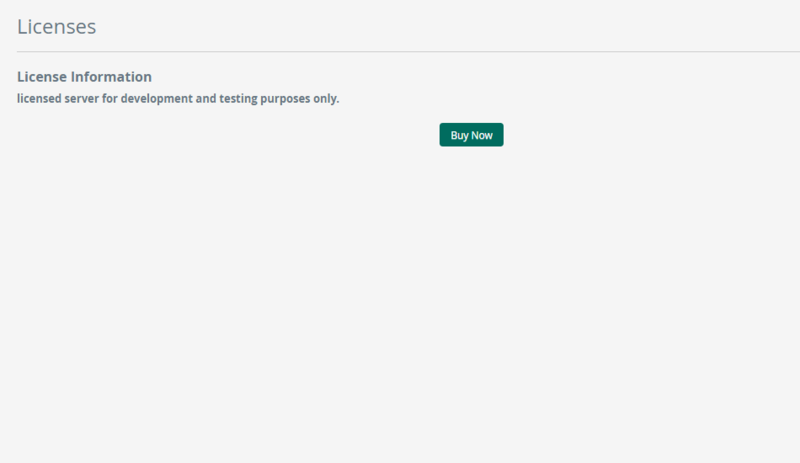 In order to activate the key you need to enter it in Bizagi Studio through the License Administration option. When a license key is activated in a production server (or computer) you have created what we call an installation. Renewals do not generate keys. However, you do need to update the information of the new expiry date in the production environment. Just click on the "Update License” button in the License Administration option. This action directly communicates with bizagi.com and updates the necessary information to reflect the renewal purchase. •Should you need to move the licenses from one server to another, contact our support team. •It is advisable to contact our support team when activating an installation in an offline server to deliver an activated key. •When making a cluster installation, if you contact our support team, we will generate the keys for each separated node. Usage based licenses and Subscription licenses include maintenance during the term of the license. Maintenance includes: new product versions to keep Bizagi up-to-date, service packs, and basic product support (No SLAs). You will receive an email with details of an online account to access Bizagi portal. In the Support section of Bizagi portal you can open support tickets to report bugs or problems, submit suggestions for product enhancement or make simple consultations regarding product functionality. In the Purchases section of Bizagi portal you are able to view and manage license information, such as, number of users per installation, unused keys and expiry dates. Be aware that Bizagi offers two support levels: basic product support included with your licenses (with no SLAs) and the Premium Support Service (with SLAs) which you may purchase separately according to your requirements. Renewals provide, usually, an additional 12 months of Bizagi usage, including updates and support. In case you decide not to renew, your Bizagi system will automatically stop working on the expiration date, your maintenance will be terminated, and you will no longer have access to software upgrades nor technical support. For Usage based licenses, approximately one month before the renewal date, Bizagi may ask you to generate a Usage report. When buying additional User licenses, first you need to decide whether they are needed for an existing installation or for a new one. In this way they will be associated to the appropriate installation. Remember that when a license key is activated in a production server (or computer) you have created what we call an installation. Each purchase has a separate expiration date. If you want to unify the renewal dates into a single one, please contact a sales rep. When buying additional Users for an existing installation you must buy the same type of User license you acquired in the first place. This is because license keys are specific for each type of license and won't work in a different one. Buying additional Users for an existing installation does not generate keys. However, you do need to update the information of the purchase in the production environment. Just follow the simple procedure to activate your additional Users. You could also buy Users for a new installation. This is, if you need to buy licenses for a different production server from the one that you used to install your first license key. This case would be handled as a first-time purchase and you will receive a new license key for your second production server. Be aware that the process to buy additional Users for existing installations differs from buying Users for new installations. The use of software or hardware that reduces the number of Users directly accessing or utilizing the Server Software (sometimes “multiplexing” or “pooling” software or hardware) does not reduce the number of User licenses required; the required number of User licenses would equal the number of distinct inputs to the multiplexing or pooling software or hardware “front end”. An example of this is a front-end (portal) application where end users fill out a form, and then a process is started in Bizagi by means of a web service or other interface. Bizagi offers a special kind of license for external (internet) users. It is called Initiator License, and gives users the right to initiate cases and participate in subsequent activities (e.g. enter additional info, adjust/update existing information or documents) of the same process instance (case) they initiated. Initiator Licenses only apply to users who are NOT employees of the company that Bizagi licensed. For internal users (employees), full licenses must be purchased irrespective of the way they use Bizagi. Initiators are licensed by user bands (1-1000, 1001-10,000, etc. ), not by individual users. Bizagi offers an academic license. To use Bizagi Software identified as “Academic Software” you must be a not-for-profit school, college, university, or institution of higher education. You can install and use the Bizagi Software free of charge for a maximum of 20 Users in each installation. Users must be authorized students, faculty or staff members. You can use the Software for non-commercial, educational purposes only, including conducting academic research or providing educational services. In order to obtain a Bizagi Academic License, a person authorized by your institution must legally bind your establishment to the corresponding terms and conditions and fill in the application form. After you have submitted the form, we will contact you by email with the next steps in the application process.